Chef Kenny Gilbert and his wife Anna are expanding their footprint in the Jacksonville area and bringing a touch of their Underground Kitchen with them, with plans to open Gilbert’s Social (GS), this fall. GS will be located at 4021 Southside Blvd (Suite 200), in the former Big John’s Crumpy’s Wings and Things location, just North of Tinsel Town. GS will feature seasonal and creative modern Southern fare with international influences. All of the dishes on the menu speak to a time in Kenny’s life, or tell a unique story of their own. Dishes like the Southern Fried Western Style Ribs pay homage to Kenny’s dad, while the Chilled Pemequid Oysters speak to Kenny’s time at The Ritz, where he first learned about macrobiotic cuisine. 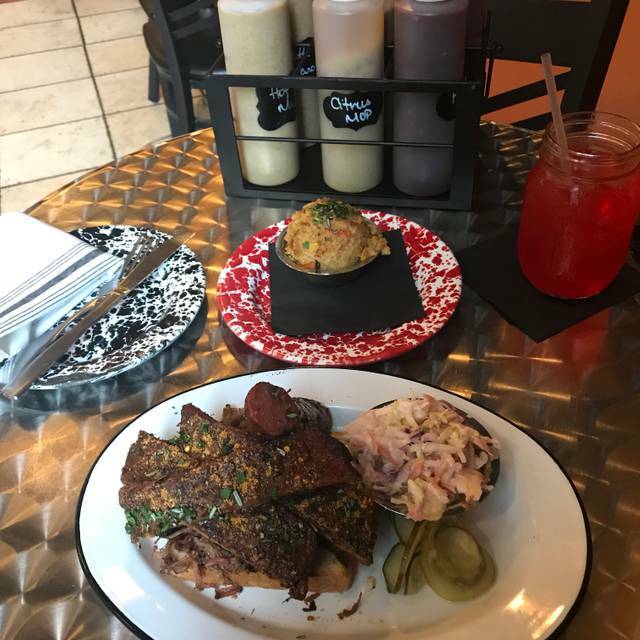 Kenny’s also bring his signature Fried and Fernandina Beach Hot Chicken, Anna’s Mac and Cheese and Smoked Pulled Pork To Duval – all favorites from the menu at his Gilbert’s Underground Kitchen in Fernandina Beach. Rachel did a great job taking care of our needs. She was helpful with the questions we had. We have been to Gilbert’s many times but the menu had changed some and Rachel pointed out changes and answered our questions. As always, the food was well prepared and delicious. Order the large platter for four of us plus some appetizers. So much food! All delish! Best BBQ in town! We have been to the Underground and the food was great. We decided to visit the Social and we were not disappointed. The service was awesome! The food was absolutely delicious! If you haven’t visited, you are missing out! Always excellent dining and service! We would recommend it but with the following observations. We were very pleased at the service - everyone was friendly, professional and efficient. But, we felt that the food was not outstanding. 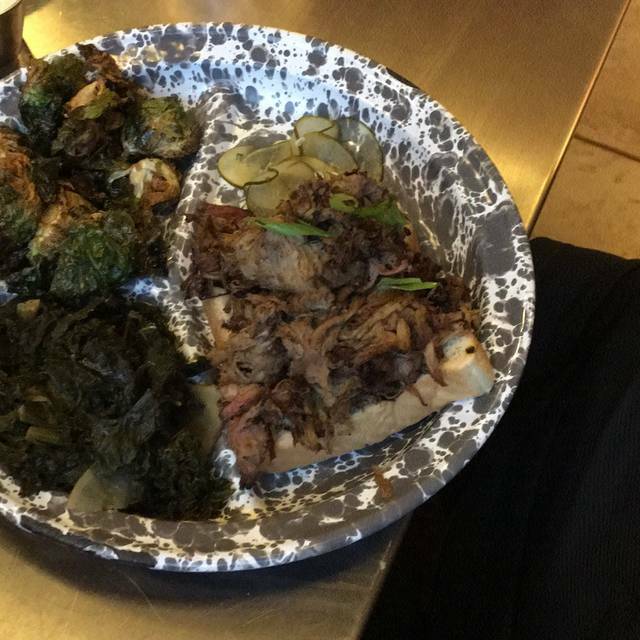 We tried the burnt ends which had good flavor and moistness. We enjoyed the brussel sprouts as well. We were pleased with those items. 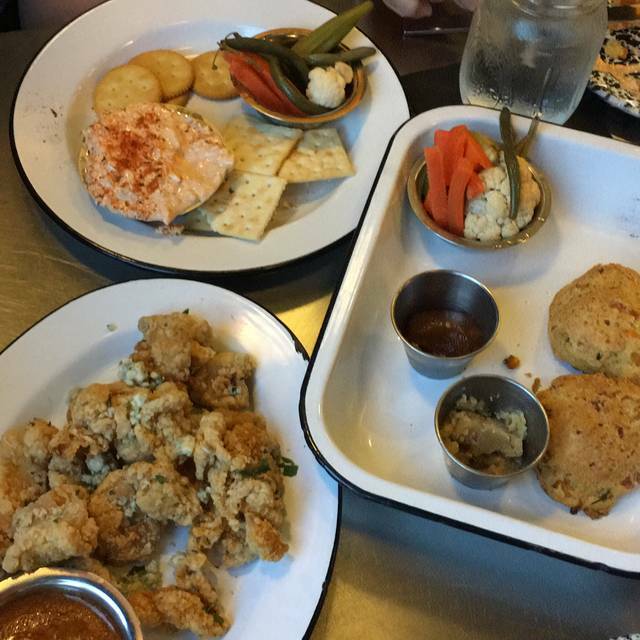 But we also had deviled eggs, pimento cheese, and dressing all of which were very bland. They weren't bad but we had heard so much good about this food that we expected lots of flavor and there was very little. There were some good tasting BBQ sauces at the table and I had ordered pulled turkey. I was surprised to see it already had a sauce on it - there was no opportunity to enjoy the sauces at the table and what was on it seemed too much (overpowering) for turkey. Even the bananas foster ice cream appeared to just be vanilla ice cream with "mashed" bananas - not bananas fried in brown sugar, cinnamon/nutmeg and butter and then while hot poured over the ice cream and served immediately. Again, it was not bad but it was not as wonderful as we thought it might be. We would go again if someone wanted to go but we would not go out of our way to try it again. Was looking forward to going to this restaurant since chef had "beat Bobby Flay". Unfortunately the dish that beat Bobby Flay was no longer on the menu. Service was a bit slow but server was polite and answered questions. The portion size of the bowl that I had, with pulled turkey, was enough for two, though a little light on the turkey. It was seasoned well and each part (greens, peas, garlic rice, turkey) had their distinct good flavor. My husband had the cat fish which was cooked well & very spicy. The coating, though crunchy & tasty, was too thick. Just a personal preference. 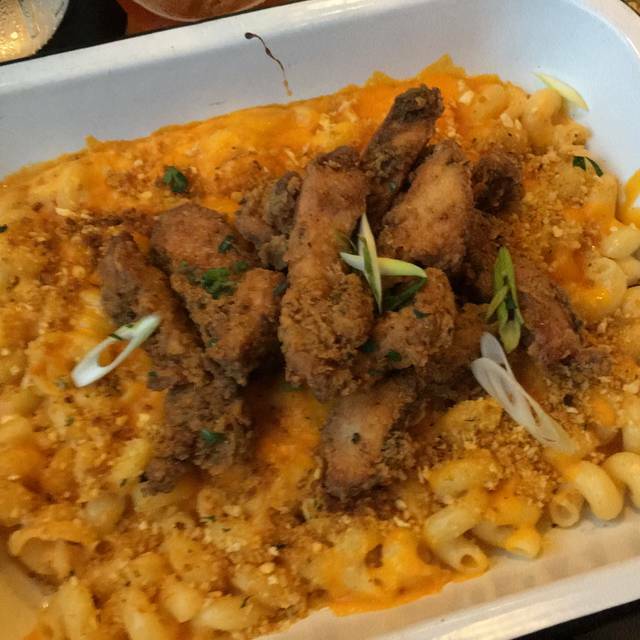 He paid an up charge for the side of Mac n cheese and the portion was small. The flavor was good, but not as stellar as it sounded when described. We skipped dessert since the only item on the menu that I thought I might try (southern fried Apple pie) was described by the server as an egg roll shaped fried dough with apples inside. I would go back and try a different menu item. 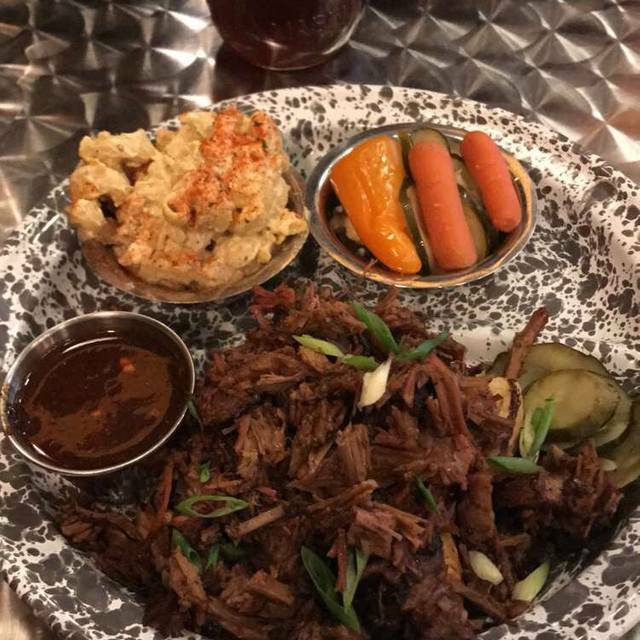 Absolutely delicious bbq. We got the assorted platter and it was more than enough for the three of us. Never had pork belly burnt ends before but sweet Jesus they were good. The ribs were crazy tender, honestly everything was fantastic. Great Arnold Palmers too, oddly enough while there Arnold Palmer’s grandson was sitting behind us. It’s not very large so I recommend reservations just to be safe. Just OK. 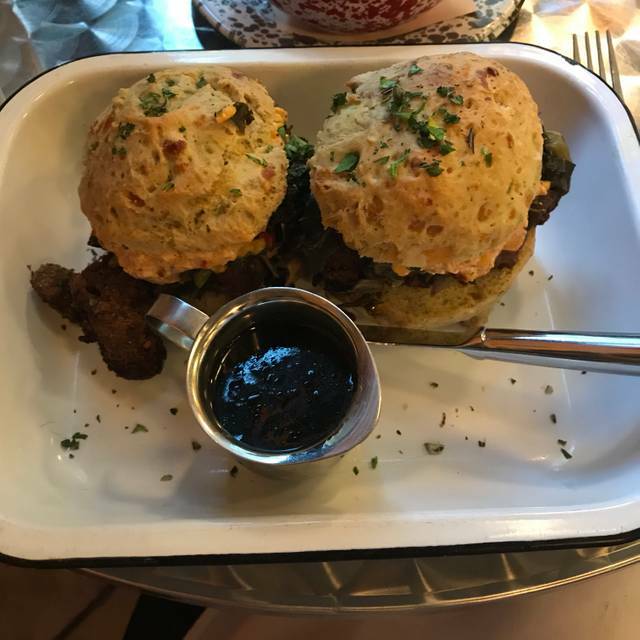 I had super high hopes about this restaurant due to the other great reviews and our love for southern-inspired cuisine; it did not live up to the hype. 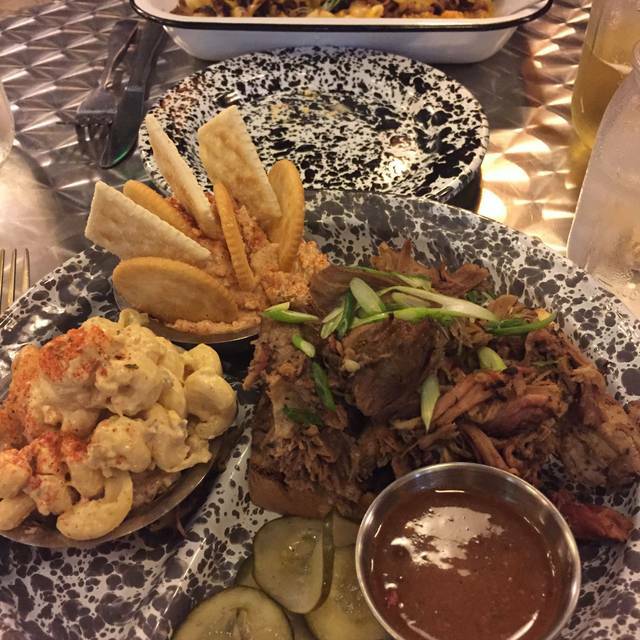 A few of our items were pretty good, mostly the appetizers, but both of our meals left us wanting more flavor. Maybe it was just an off night. Consistently good upscaled comfort food. Love the revised menu. It’s nice to have vegetarian options that don’t include meat seasonings! Went for a work dinner - apps were great, server was attentive, dinner was awesome! Casual dining with 5star recipies. Haven’t been disappointed with a Chef Kenny restaurant yet! Do yourself a favor and check it out! We loved this place. The dishes were unique and delicious. Our server was fun, helpful and quick. We thoroughly enjoyed our visit and will definitely return. We have been to Gilbert's on numerous occasions usually for dinner but this time was for lunch. The portions are extremely generous and the quality of the meats is outstanding. We had six adults in our party and the sampler platter was more than enough meat - we even had left overs to take home for lunch the next day. The music selection is good but the sound level is a bit higher than I would normally prefer - somewhat difficult to carry on a conversation at the table with those at the other end. There is an excellent variety of side dishes that is almost guaranteed to fit any appetite. We typically choose several due to differences in preferences. Always a great experience at Gilbert’s! Food was delicious as always. Thank you for contributing to a great night! Excellent food, prompt courteous service. 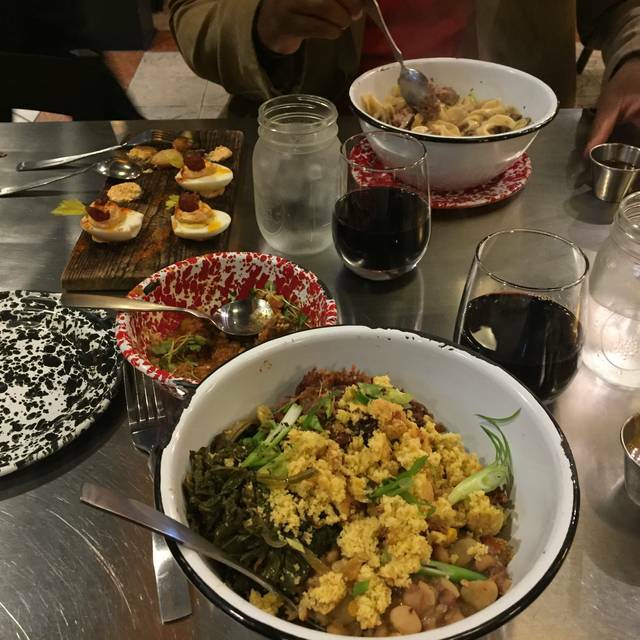 The uptown spin on traditional Southern cooking is really outstanding. Everything was awesome! The food, the service....it was a great choice to go here for my daughter's birthday celebration! Great food! Wonderful smoked fried chicken thighs, cornbread stuffing, turnip greens, and Brussel sprouts! The fried catfish was good but the hot sauce was overwhelming, not too hot but that's all you taste. The cucumber salad meh pass. Great service from Chucky! We will be back for more selections! Great ambiance and food. Love the chocolate cream brûlée’s toasted marshmallow dessert. Excellent food and service on a busy Valentines Day. Excellent. Excellent Food! Never disappointed with any dish I order. Admittedly, I'm not a huge fan of BBQ. That being said I found the food underwhelming. There was nothing particularly notable or unique about the offerings, but all my companions were satisfied with their meals. The establishment lacks a full bar and I found their beer and wine offerings uninspired. The ambiance was equally disappointing. The service surpassed my expectations. 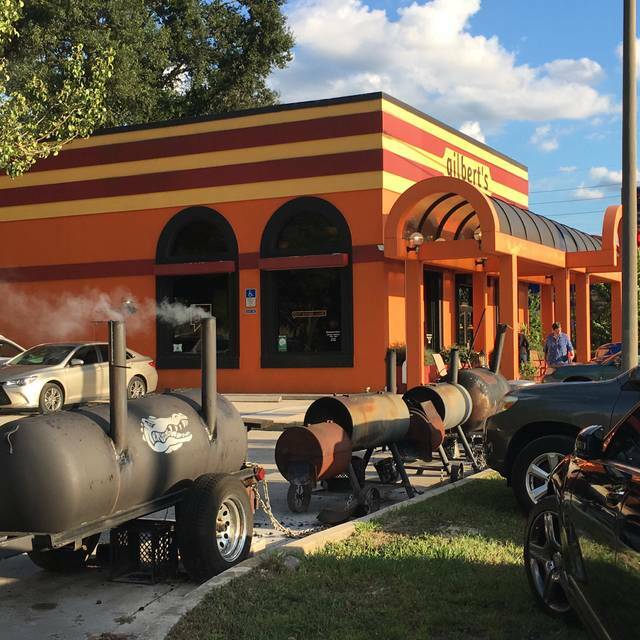 Summarily if you enjoy BBQ you may find Gilbert's more satisfying than me, but even if that is the case, there seems to be many options for BBQ in Jacksonville that are more comfortable. Fabulous flavors! The mixture of spices and sauces is one of a kind!! First time at any Gilbert’s restaurant. We loved it. So cozy with a fab menu. Great server. We’ll be back. I had a great dinner experience at Gilbert's! My wife and I split a platter of the burnt ends (which were probably the most tender burnt ends I've ever had. I didn't even know that was possible :)) and a Kenny's Southern Bowl with pulled pork which had the tastiest garlic rice and greens in it. Heavy garlic, but I dig that. I mean, why else call it "garlic rice", yeah? My mom got the brisket (sliced) and my dad got the burnt ends platter with cheese grits and cornbread dressing for sides. My somewhat conservative eater 11 year old daughter asked for the buttered noodles minus the butter and they provided it with nary a complaint. Pecan chocolate pie was VERY rich but yummy. We brought it home and made coffee drinks a couple of hours later because I was too stuffed to appreciate it at the restaurant. Not chain BBQ cheap, but also tastes a heck of a lot better. Friendly, helpful staff. Recommended. I had the Smoked Brisket Stroganoff. It was very good, but not a typical stroganoff. The mac n cheese and brussel sprouts were amazing! The food is amazing and we got to meet Kenny! He was so nice and took a picture with us. We’ve been to his restaurants at the beach and wanted to check this one out. They are all a bit different but the food and service is fantastic at all of them. We dined on News Year eve and Gilbert's had a special menu that differed from the usual menu. The food and service was excellent, but I thought it was a little over priced at $100 per person. I think $75 would have been more in line. We dine regularly at Gilbert's and have never had a bad meal or service. I liked that they tried something different on News Year eve and as previously stated, the meal and service was excellent. From the incredible food to the cozy ambiance it was a fantastic experience and we will definitely be back again. Met our oldest son and daughter in law along with our youngest son and his girlfriend for dinner. The food was excellent and the atmosphere was great. Our waitress was very pleasant, knowledgable and continued to check on us to be sure we had everything that we needed. Over all, a great experience. Would definately recommend to friends and family.